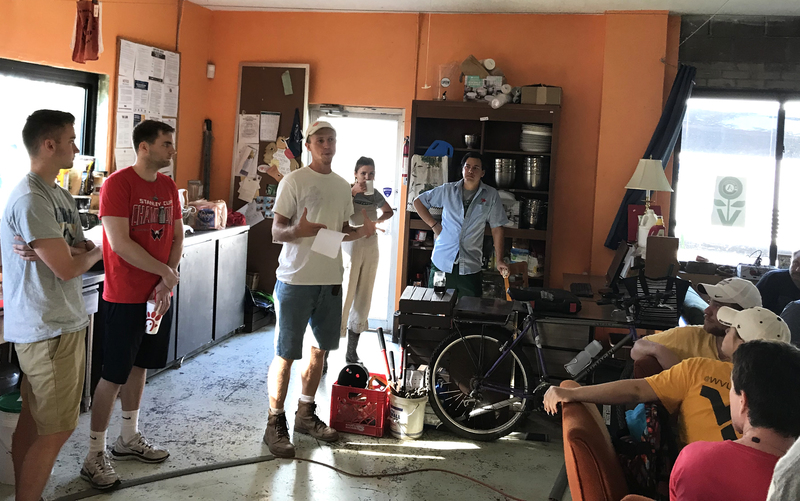 A group of 44 Supply Chain Technology students from WVU visited a food hub in the Wheeling area as part of its collaborative effort with Grow Ohio Valley to combat food insecurity. The students from the John Chambers College of Business and Economics walked to a greenhouse on one of GOV’s farms. (Editor’s note: A luncheon, presentations and networking reception will be held Friday (Dec. 7) from 12:30 - 4:30 p.m. at the Morgantown Marriott at Waterfront Place. Presentations will include tools student working groups created: an actual 3-D model of the marketplace floor plan to aid in product placement, informational staffing videos about the GOV market and a produce-cooling prototype that will increase shelf life of fresh products. A group of West Virginia University students is addressing the growing problem of “food deserts” in the state, as the combination of a declining rural population and below average income have left many West Virginians living significant distances from supermarkets and reliable food sources. That project, as it turns out, may not only help with West Virginia’s food access problem, but may also address the problem on a global scale. Supply chain students at the John Chambers College of Business and Economics have struck a partnership with the Grow Ohio Valley organization in Wheeling on a project aimed at reducing food deserts. Through the partnership, 44 students from the supply chain technology course are helping Grow Ohio Valley get healthy and affordable food into the hands of those who want and need it, culminating with the May opening of The Public Market, to be located in the Robert C. Byrd Intermodal Transportation Terminal in downtown Wheeling. According to U.S. hunger relief organization Feeding America, 267,280 West Virginians, including 75,970 children, are “food insecure,” meaning that they do not know where or when they will get their next meal. Senior global supply chain management major and Pittsburgh native Rena Kobelak said the project has not only yielded new ways to help eliminate food deserts, but has provided valuable real-world experiences for students. Holly Leister, a senior supply chain major from Montgomery, Pennsylvania, said the project applied the principals students learned in Saldanha’s class, including what customers want. Leister added that the GOV project will go far beyond fruits and vegetables, providing value-added products like frozen foods and healthy choices for working families and people with busy home schedules. “Customers want the 7 Rs: the right product at the right place at the right price for the right customer in the right condition at the right time in the right quantity,” Leister said. Grow Ohio Valley was founded in Wheeling in 2014, and has completed the conversion of two acres of abandoned urban land into diversified vegetable farms and an additional 3.5 acres in production at a rural farm site. In 2017, GOV also planted a 3.5-acre orchard in collaboration with the Wheeling Housing Authority. A group of West Virginia University students is addressing the growing problem of "food deserts" in the state, as the combination of a declining rural population and below average income have left many West Virginians living significant distances from supermarkets and reliable food sources. That project, as Associate Professor John Saldanha explains in the latest edition of Inside WVU today, may not only help with West Virginia’s food access problem, but may also address the problem on a global scale. Supply chain students from WVU’s John Chambers College of Business and Economics are shown listening to Danny Swan of Grow Ohio Valley, an organization working to reduce food insecurity in the Wheeling area. The students analyzed GOV’s supply chain systems and business practices as the organization prepares to open a market in downtown Wheeling in May 2019 that provides healthy, affordable food to those who may not have ready access to it.